It is so wonderful going to sleep to the sound of frogs croaking to each other around the pond outside my bedroom window and then waking up of a morning to the sound of the many birds greeting each other good morning. 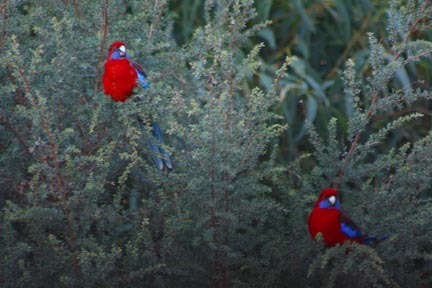 I also have a few Crimson Rosella's that visit the garden and enjoy having a chew on the Quinces. Wow, that's so cool that there's parrots flying about. I had to google Crimson Rosella's to find out more about them, I'd never heard of these before. I love their color, such a vivid red. It sounds like you're enjoying the country life, that's awesome. I love the country... as I look out my window here in the city to see my new neighbor trying to fit her car into a spot where I'm parked, yikes she's getting to close for comfort... like seriously, park your car in the back! I'm parked out front because I asked them to leave some space in the front of my house for when I have company, she's too scared to go out back in the morning....seriously! Grrr, I'm glad they're only renting the house, maybe they won't be long term tenants! Wow, I sure digress... lol. Have a fantastic week and take care! Wow that's a great picture! I love night sounds too!